St. Bernadette Catholic Church in Fuquay Varina, NC is a rather large church facility with a congregation of approximately 2,500. It has been in existence since the dedication of the first building in 1990. 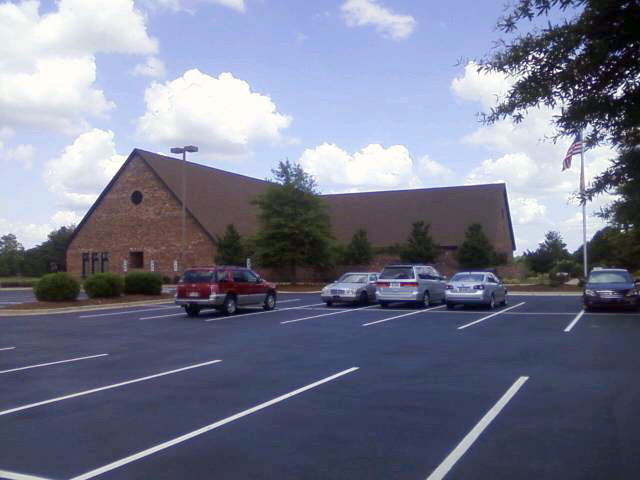 Over the years, the facility and congregation have grown together. Today, there is a very large sanctuary hall, where mass is held multiple times each week, a fellowship hall area (the original church building), and a “Learning Center” which houses the church offices and meeting and classrooms. 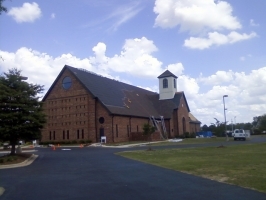 It is located on a somewhat main artery that connects the rural area to the Town of Fuquay-Varina. I travel this road often and had driven by the facility many times, making note of the apparent wind-damage on the main, southwest-facing roof slope. It appeared that several full shingle mats were missing, and one could see other areas that would indicate other damage caused by winds. The church sits in an open field, unprotected by any significant structures or tree-stands. One day, as I was driving by, I dared to dream that maybe we could help these folks in a significant way. I visited the office in the Learning Center and inquired as to which person within the church managed any facilities-related issues. Having that name and his contact information in hand, I made my first call and scheduled a brief information-gathering meeting. 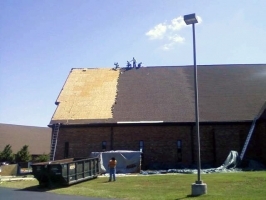 Apparently, this roof had been a rather sore-spot with the facilities manager, and the rest of the congregation for many years. 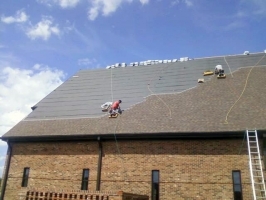 The area where there were shingles missing had resulted in a leak during heavy rain storms. The leak was directly above the lectern area in the main sanctuary, and had caused a lot of concern, if not so much damage, as the floor was a durable tile. I engaged other experts from American Roofing to assist me in performing a roof inspection, which had been requested during this initial meeting. The purpose of the inspection was to assess the condition of the roof, document any weather-related damage, and finally offer solutions for its repair. A meeting was held with the head Priest and the facilities manager wherein our results were presented. 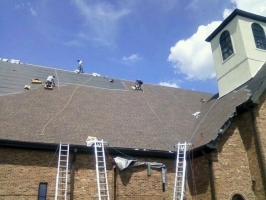 There had been wind damage, as was apparent, and it was found in many areas, some which had been repaired; these repairs were quite noticeable from distance as well, and contributed to a checker-board look to some sections of the roof. Indications of hail damage were also found. Further, the main sanctuary had been added on to a few years back; they had extended each end of the sanctuary. The company that had done the roof install had attempted to “marry in” similarly colored and styled shingles with the existing roof, but had done a poor job of it. Seams from the eave to the ridge could be seen in the four areas of transition. This bothered the church folks quite a bit. 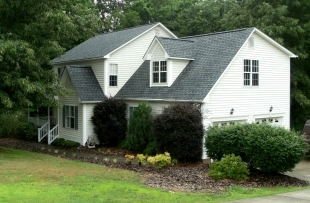 The work had been done by a local, very old and reputable roofing company in the Raleigh area. Needless to say, the church folks did not have much good to say about them. 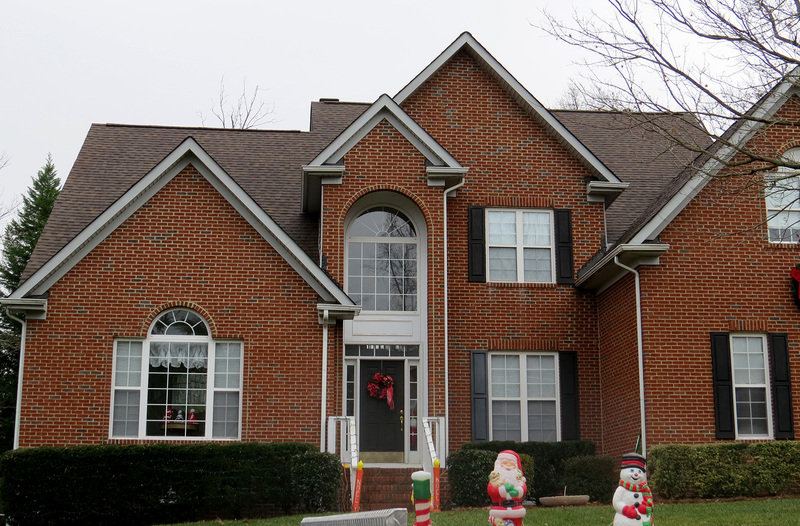 After time spent gaining their trust, they agreed to allow American Roofing & Vinyl Siding to engage the adjuster of their insurance carrier and see if they could offer some remedy for the roof damage. 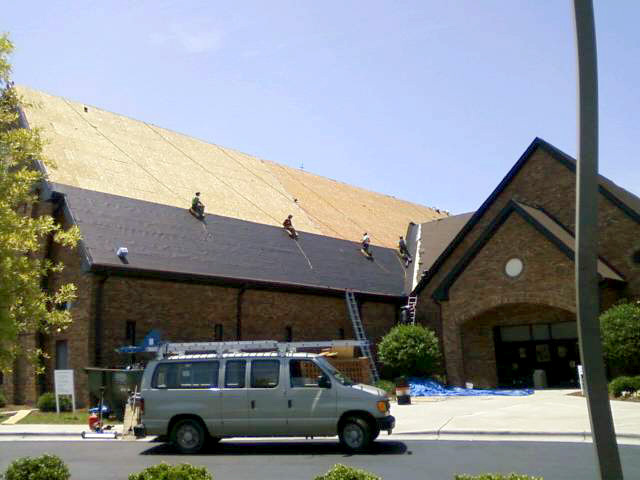 At this point, American Roofing was only concerned with the main sanctuary roof, and not that on the Learning Center. American Roofing & Vinyl Siding met the adjuster in the field; 5 representatives of American Roofing were on hand to assist in the adjustment. The adjuster showed up alone, but was glad the help was there, as it was a steep roof (12/12) and the main ridge was about 50 feet off the ground. In the course of the next 90 minutes, American Roofing marked off the roof and assisted the adjuster in documenting the damage on the main roof. His assessment was that the roof needed full replacement. Upon completion of the main roof assessment, the adjuster also indicated that he wanted to examine the roof of the Learning Center building. The main building measured out to about 235 squares of roofing. The Learning Center was about 180 squares more. The inspection operation moved over to the Learning Center where the roof was examined and marked off during the next 60 minutes. 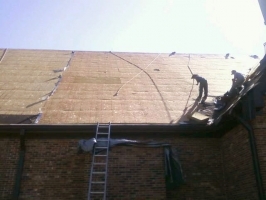 Upon completion of this process, the adjuster agreed to a full replacement of this roof as well. American Roofing & Vinyl Siding prepared an estimate document using Xactimate software and developed a full square-footage report using Pictometry. These were provided to the adjuster wherein he agreed to our pricing and measurements. 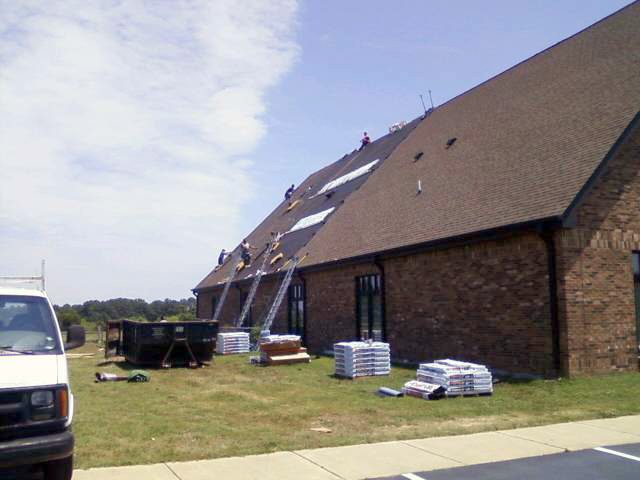 This adjuster worked for a third-party firm located in the Raleigh area. He took our information, reviewed it and sent it on to the carrier for final approval. 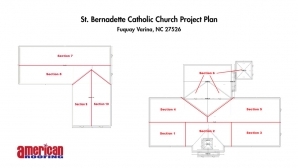 The carrier approved the replacement project and began the process for disbursement of the Actual Cost Value (ACV) check so that work could begin. 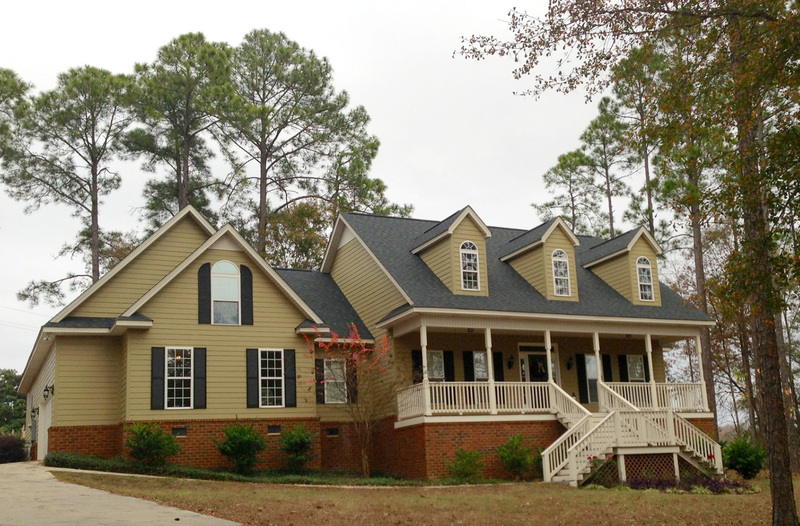 Because of the size and scope of this project in comparison to a residential roof repair project, a different approach was necessary. There would have to be multiple waste containers, multiple materials deliveries (to avoid leaving materials unsecured during night-time hours) as well as the logistics of having the appropriate levels of skilled labor on site. The church roof was divided up into theoretical sections so that each work for each day had a defined purpose. The project was indeed a big challenge, but everyone working hard, and together, made it come off flawlessly. It was certainly a challenge to ensure that any collateral damage from the tear-off be held to a minimum. In many cases, “dams” were built and installed at the eave end of the roof to catch the waste shingles as they were removed from the roof. The shingles, when torn away, formed large “mats” of multiple shingles and these had to be carefully slid down the roof as the weight would cause them to “avalanche” down if allowed to free-fall. The process was really simple. 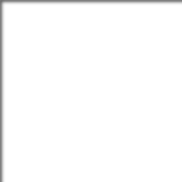 A pre-determined area was chosen for the day’s work. 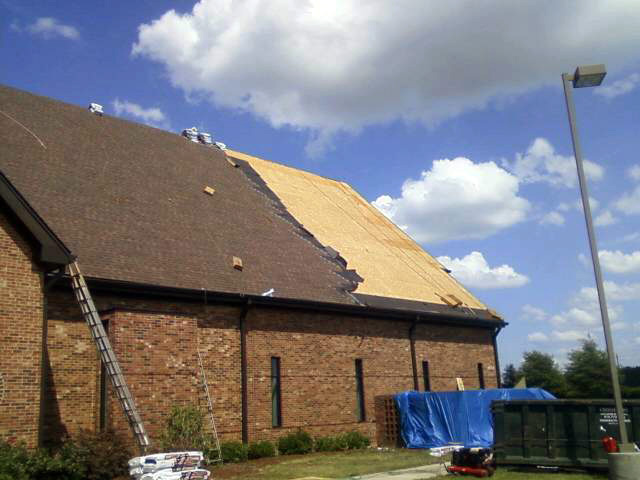 The first part of the process was tearing away the existing roofing. The second step was installation of the new underlayment. 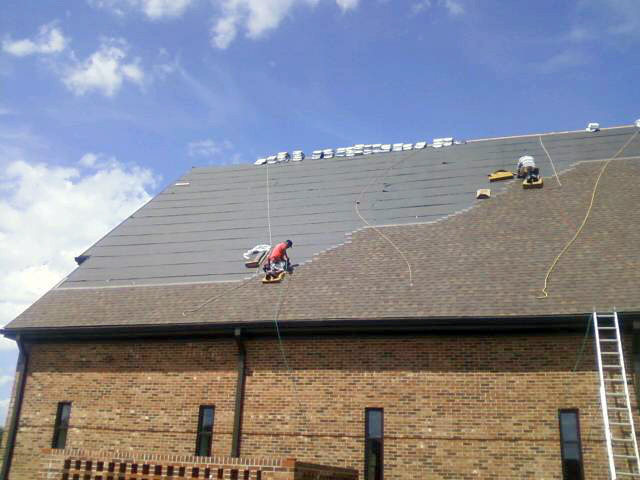 The final part of the process was the application of the new shingles. This is obviously exactly as one would perform on a residence, only on a much larger scale. 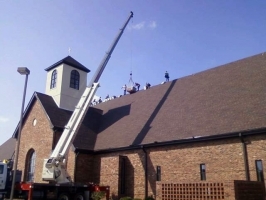 A crane was engaged on three separate occasions to facilitate the lifting of pallets of shingles up to the ridge of each roof to enable an easier off-loading and staging of materials for use. 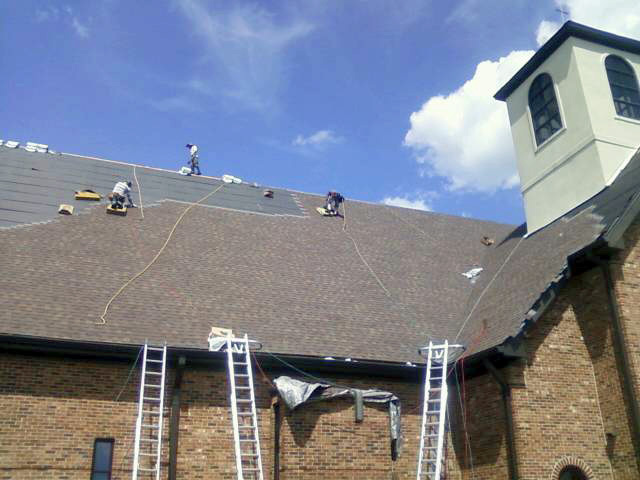 Each day this process was repeated until all roof surfaces had been restored. The project took about 2-1/2 weeks to complete; several rain days delayed the completion, which should have been about 10 work days. The final touch was the removal of shingles from the two cupola towers, and the re-roofing of those areas. This was accomplished by use of a 60’ mobile boom lift. After that, site clean-up took about two full days, although much of the clean-up was performed by the labor crews at the close of each production day. Do you have something to share related to this case study? We would love to hear from you so leave your comments below!